I am still trying to put together the best nutrition before, during and after the long swim. My two cold water swims to date are the best example I have of proper feeding. This knowledge/information was handed down from my spiritual advisor Mr Hobbs and don’t forget…what ever Brent does or eats I do too! After all, he did swim the channel. I have been successful with a high carbohydrate powder mixed with warm water. This is the quickest and easiest way to feed. It is of utmost importance that you get used to these feeds well in advance as they can take some time for your body to get used to. The quantity of mix is also critical as to much can overload and upset your system. The best thing to do is follow the manufactures recommended dosage levels. 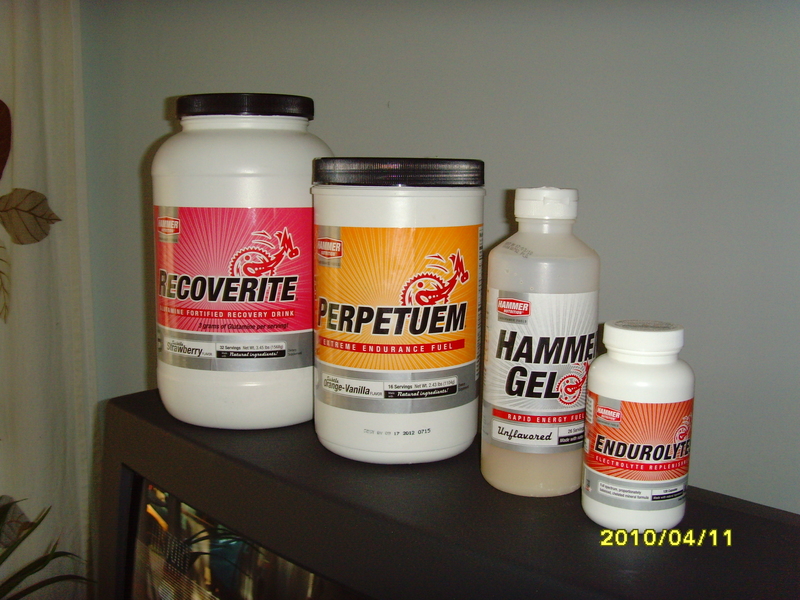 Right now I am using the Hammergel products for longer swims (Perpetuem, Recoverite, Hammer gel and Endurolytes). For the channel I plan to feed every 20-30 minutes, depending on how I feel and my caloric needs. My support crew will throw a water bottle ahead of me; at the same time I will tread water, drink the mix, and start swimming as soon as possible. I really don’t want to feed longer than 15-20 seconds because the longer I take to feed the faster my core temperature will drop and the more susceptible to hyperthermia I will become. Feeding will be a mental break as well as physical; swimming from feed to feed is a pattern that can be something to look forward to.